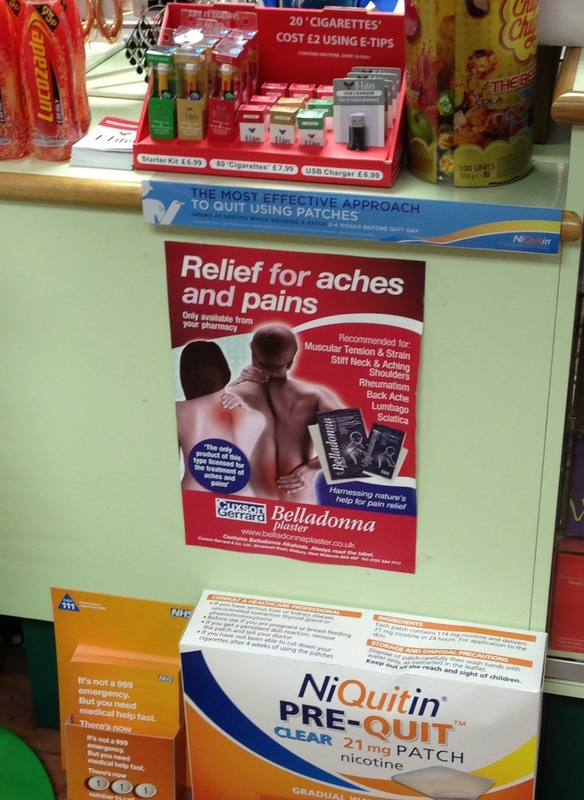 Mrs P earlier sent me a picture of a scene which would give a pharma marketing exec nightmares if they were to see it. Note the smartly presented e-cigs prominently displayed on the counter at eye level, while NiQuitIn's battered empty box is relegated to the floor. E-cigs are in your backyard, pharma. It's a turf war! My local chemist has a poster in the window advertising the e-cigs that they sell. It's an independent rather than part of a chain. I'm surprised the local MSP hasn't condemned them yet. I attended the hospital today and they were selling the e cigs in the shop there, also told at my Drs. surgery that I could use one there while I had a two hour wait after a glucose test. They are fighting a losing battle I think.